SATURDAY Oct 6th at 10am Hidden History of Black Boston; 2 hours of Afro-boston, U.S. & GLOBAL "Ourstory". Cost: $10 donation*. Bring water, comfortable shoes, cameras & disc./questions (smile). Discover the African presence in Colonial Boston, the 'stolenwealth' of Massachusetts & role in New England's growth in the trans-Atlantic enslavement enterprise. Visit the sites & homes where race men and women lived & resisted. Get a new perspective on Black migration & growth of our Black community. Not just a Heritage Tour' but a Mobile Classroom you don't want to miss. Seats limited. Van Tours depart rain or shine, most weekends (Apr-Oct). Price $30 (all ages-map, reading materials & snack included). Tickets tend to sell out quickly, so we suggest you purchase early. "Learn about African America and anti-blackness in Boston." We give thanks for your taking of your time to link up (smile). We will respond as soon as possible. Bro. Joel Mackall is an award winning Educator & Project Developer with the ReIdren Business Group based in Roxbury MA. He is the co-founder of the S.O.S. Living Museum, the Hidden History of Black Boston Tours, the Nubian Writer's Group and is a self-published author. He has also served as secretary of the Cameroonians of Lowell Association, as an officer on the Warren Gardens Housing Cooperative board, on the advisory council of the Network of Immigrant and African American Solidarity and as a technology chairperson with the Black Community Information Center. Bro. Joel presented "Excellence AND Culture: Operating Your Cooperative Better, Simpler and Truer" at the National Association of Housing Cooperatives Annual Conference in St. Thomas, US Virgin Islands and "Why Do We Black Folks Hate On Each Other?" at the Association for the Study of Classical African Civilizations' Ancient Egyptian Studies Conference in Newark, NJ. He has led/facilitated numerous professional workshops in Greater Boston on topics including genealogy, African & world history , business design and technology at the Freedom House, Mother Caroline Academy, Warren Gardens, Roxbury Multi-Service Center, Roxbury Community College, Emerson College, Lesley College, South Bay House of Correction, almost all of the BPL neighborhood branches and Walden Square Technology Center (north Cambridge), in both English and Spanish. To learn more/contact Joel at cell# below or drop a message in the form. We give thanks for your interest (smile) and will contact you as soon as possible. Public Transportation: Haymarket MBTA station (Orange and Green Lines, MBTA bus routes). "I highly recommend the Hidden History of Black Boston Tour. It was enlightening. 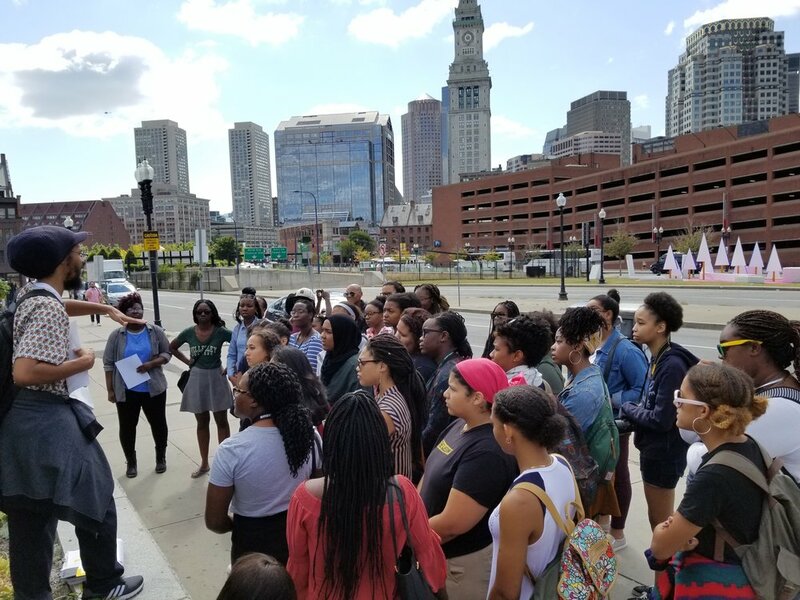 To stand on sites in the local areas of Boston and vicinity that show how African American activists dedicated their lives to the cuase of freedom was inspiring. It elucidated the importance of fulfilling the mission of NIAAS. Joel is a dedicated tour leader. He is not only well informed but his historical research is ongoing. Additional information will be provided on future tours. We live in the North. You will learn about Phillis Wheatley, a slave in Boston in the 1700s who not only became literate but was the first Black person and the third woman in the United States to publish a book of poems. It is chilling to be just outside of Boston in Medford, Massachusetts on property, now a museum, where one of the buildings was slave quarters and the other the master's house. But there it is, in your face. Burial grounds are often visible to us in Massachusetts, as we drive by them. Joel takes you into the cemetery where you can see, touch and ponder the burial place of Prince Hall who is recognized as the father of Black Masonry in the United States. He established his African Fraternal Lodge of Masons as far back as 1784. Because of Prince Hall's efforts, the world-wide lodge numbers in present day have increased to well over 4,500. I was moved by this historical information being part of Joel's tour because my late father was a Prince Hall mason. We totaled eight people, comfortable on this van tour. I knew that I was in good company. Look for the next opportunity to go on this tour. Joel, the great tour guide, will not disappoint! Sincerely, Dolores"
"HHBNE gave me gold and diamonds from this tour because of the knowledge I gained; such remarkable history was revealed. I have lived in the Boston area for over ten years and have never been anywhere as important and educative like the places we visited on this tour. I was so moved to see the house that Malcolm X lived in and so proud knowing that one of my contry women, a slave in Boston in the 1700s, was literate, a writer and was the first black person and the third woman in the United States to publish a book of poems. Thank you Joel & Kotey you are the best."